A long-standing theory predicting peak ecological diversity under intermediate disturbance regimes has come under fire. 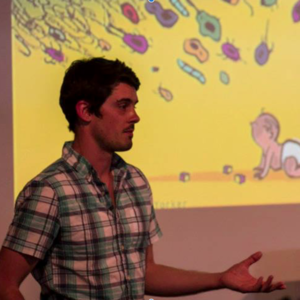 In our recent study, we address this issue using ecologically complex laboratory microcosms. Diversity is often associated with the functional stability of ecological communities from microbes to macroorganisms. Understanding how diversity responds to environmental perturbations and the consequences of this relationship for ecosystem function are thus central challenges in ecology. 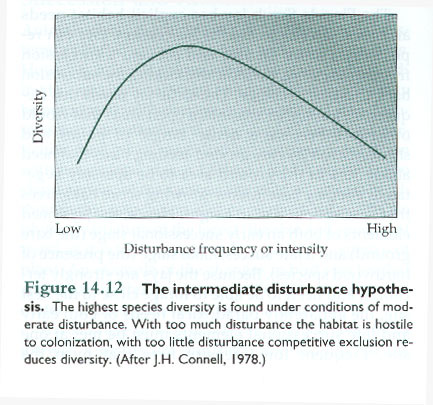 The Intermediate Disturbance Hypothesis (IDH) predicts a peaked relationship between diversity and disturbance (Connell, 1978; Sousa, 1979) and has been an important theoretical foundation for understanding diversity-disturbance relationships (DDRs) in ecological systems. The original mechanism proposed for the IDH was the intermittent resetting of ecological succession in forests and coral reefs (e.g. see above image). Disturbances were shown to promote the co-existence of early and late-successional organisms due to competition-colonization tradeoffs. Despite the success of this theory in explaining patterns of diversity in certain systems (Shiel and Burslem, 2013), the IDH has been supported by fewer than half of all empirical studies (Mackey and Currie, 2001), leading to a call for its outright rejection (Fox, 2013). In our current study (Gibbons et al., 2016), we set out to test diversity-disturbance theory using ecologically complex, replicated bacterial microcosms. Our experimental community was isolated from Lake Ontario and cultivated on autotrophic medium (i.e. no organic carbon source). The community converged on a stable configuration after many months of growth in the lab, consisting of a single dominant cyanobacterium (Synechococcus elongatus) and a diverse assemblage of heterotrophic bacteria. 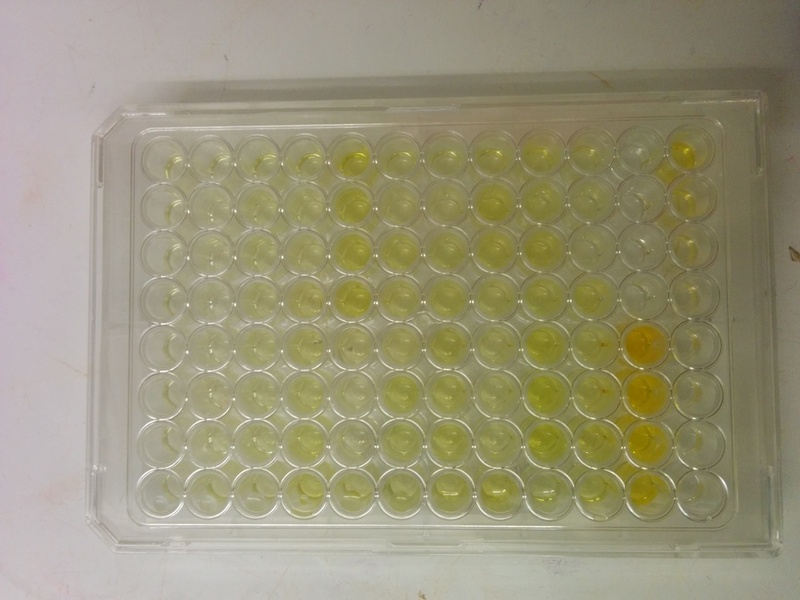 This enrichment culture was used to inoculate a 96-well plate experiments where we independently varied the frequency and intensity of two qualitatively different types of disturbance over the course of a month (biomass removal & dilution with fresh medium, and UV light exposure). A priori, we expected our biomass removal treatments to simply re-scale total community biomass without selecting for particular taxa - thus having little-to-no effect on community diversity. UV disturbances, on the other hand, were expected to selectively target certain susceptible organisms and thereby alter community diversity. In our analyses, we focused on a single trophic level: the heterotrophic bacteria. Our major result was that both biomass removal and UV disturbances gave rise to peaked DDRs. As expected, UV disturbances drove consistent changes in community diversity, with a coexistence of UV-susceptible and UV-resistant taxa at intermediate disturbance rates (intensity x frequency). For biomass removal, on the other hand, peaked DDRs were transient. Contrary to our initial expectation, biomass removal had a significant effect on community diversity, which appeared to be due to changing concentrations of a limiting nutrient - likely phosphate - upon addition of fresh medium. Changing phosphate concentrations appeared to tip the competitive balance back and forth between two species, with coexistence at intermediate disturbance rates. This result is similar to prior work in single-species microcosms, where biomass removal events were found to affect oxygen concentrations and forced coexistence of multiple sub-strains (Buckling et al., 2000). Thus, our biomass removal treatment cannot be viewed as non-selective mortality, but as a force that alters the physicochemical structure of the environment. Over time, it became apparent that a feedback between bacterial biomass and the rate of phosphate depletion in the medium attenuated the influence of biomass removal on the system. We built a simplified consumer-resource model of our biomass removal experiments and saw the same transient diversity peak due to feedback attenuation. We suggest that ecological feedbacks that reduce the impact of disturbances on environmental parameters are common, and could be partially responsible for the discord between IDH and empirical results. In addition to finding peaked DDRs, we found that community composition was less predictable at intermediate rates of disturbance. This suggests disturbance-induced diversity maxima may also be minema in community stability, which has implications for conservation. It may not be desirable to optimize for ecological diversity if this optimization reduces the stability of the ecosystem. Finally, in our experimental system and in our simplified consumer resource model, we found that disturbance intensity and frequency could be combined to generate a one-dimensional measure of disturbance (i.e. disturbance rate = intensity x frequency) without loss of information. This suggests that there is a simple multiplicative relationship between disturbance intensity and frequency. However, we cannot exclude the potential for non-multiplicative effects between disturbance intensity and frequency in other types of ecosystems (Miller et al., 2011). In summary, we developed a controlled experimental system for testing the DDRs in the laboratory. We found support for peaked DDRs, but also identified how these DDRs can be transient due to ecological feedbacks. Based on our results, we define unimodal DDRs as non-equilibrium mixtures of incompatible ecological states defined by fitness tradeoffs along an environmental gradient (e.g. see above image), maintained by disturbance-induced environmental heterogeneity. Whether or not the IDH is considered a valid theory (Fox, 2013), we hope our results shed some light on why discrepancies can arise between DDR theory and empirical results. Moving forward, we hope other research groups will perform similar studies in other systems to assess the generality of our results. From the use of antibiotics in the mammalian gut to the eutrophication of freshwater lakes, having reliable models for how community diversity responds to disturbance will inform our ability to predict the behavior of ecological systems in the presence of perturbations. Citation: Gibbons SM, Scholz M, Hutchison AL, Dinner AR, Gilbert JA, Coleman ML. 2016. 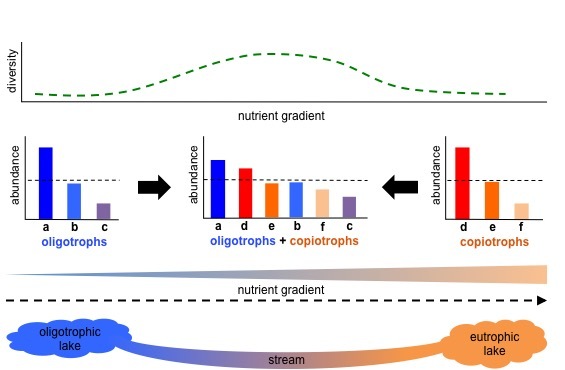 Disturbance regimes predictably alter diversity in an ecologically complex bacterial system. mBio 7(6):e01372-16. doi:10.1128/mBio.01372-16.